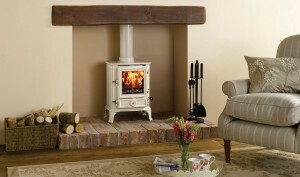 We have fitted stoves and fires for many satisfied customers over the years. Here are comments from just a few of them. Please find enclosed my cheque for the balance of payment for the supply and fitting of my woodburner stove. From you doing the survey, then the removal of my old gas fire and surround by your ‘bricky’ (Graham), who did a first class job, remodelling my fireplace to my exact requirements (by building two 9inch brick-piers with rural type bricks), adding the two courses of bricks on top with the corbled effect to support the oak beam mantle. This man is a true craftsman who takes pride in his work (‘old-school’). Then there were your fitters – Dave and Justin – who carried out the installing of the stove and cutting by hand-saw the air-dried oak beam (to fit the exact width of the chimney breast) then planing it to a perfect finish, which I have treated with bees wax polish to retain the true beauty of the wood. Mr Dixon, may I thank you for a first class job, carried out by true craftsmen, which I’m afraid is no longer the standard of today’s workforce. Many thanks, brilliant installation. Graham and Marcus were nice chaps and, all in all, [we are] very satisfied customers, thank you. Just a note to thank you for our stove and chimney (Trevor’s indulgence!). From the helpful information in choosing such a beautiful looking and brilliantly efficient stove (and then to learn you were selling off one as ex-showroom) to the very tricky fixing of the flues out of the roof and with our ‘take’ (no-one can believe it isn’t real) chimney. Your fitters were a delight to have here – clean, careful and knowledgeable. Our builders were very impressed and I am sure Dave Golding will be recommending you. So, getting the picture? We are thrilled and thank you all so much. P.S. It’s got a brilliant ‘draw’ too! The wood burning stove looks fantastic! Would like to say thank you to The Stove Shop for fitting my wood-burner last week. We list it on Saturday evening for the first time – really pleased with the result!! Pulled round the armchairs, shared a whisky and ate chocolate. I am in the process of renovating an old fisherman’s cottage and the stove looks fantastic! Very impressed with the 2 guys who came to fit the stove. With an old house there were some issues with getting the flue through the roof but these were dealt with in a very professional manner. They were extremely tidy, explained everything they were doing and nice to have around. Even though the job took longer than estimated, they completed the installation within 3 days. As I knew nothing about wood-burning stoves previously, I would definitely recommend The Stove Shop.